Previously on the site of McDonald's by the Fortune of War roundabout. Staff photographs taken during Enefer’s heyday. The Christensen family ran it between 1945 & 1971. The high number of staff employed reflects the volume of trade enjoyed by this enterprise. 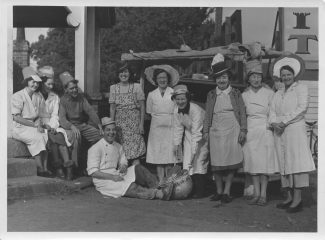 I believe the photographs were taken by Bill Burrough, a local photographer who lived in nearby King’s Crescent and whose wife worked at Enefer’s. The “kiss-me-quick” hats were very popular with the weekend coach trade. Front row: Unknown – Robby – Toni – unknown. 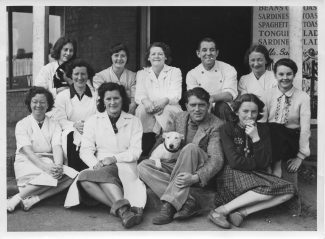 Front row: Agnes Lewis (daughter of Anne Lewis) – Mrs Keeble – Hilda Chapman – Erik Christensen with Peggy the dog. 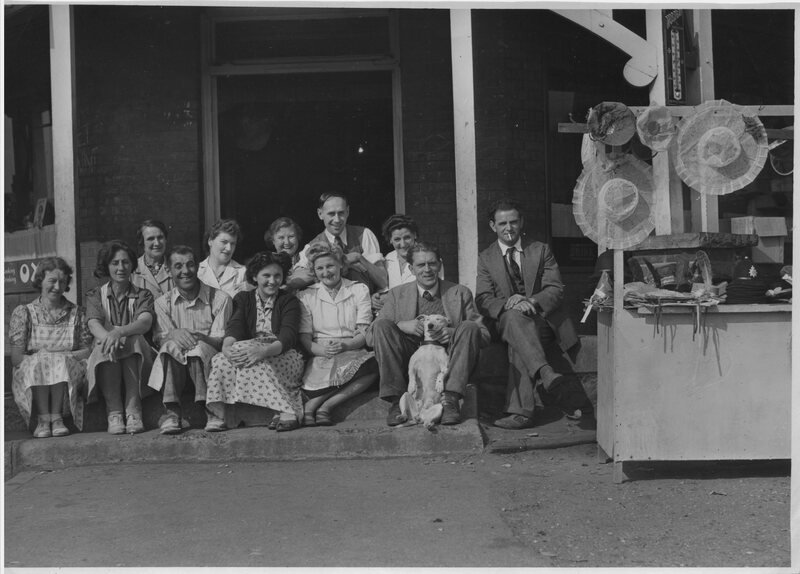 Front row: Unknown – Robby – Toni – Erik Christensen with Peggy the dog – Gayle Christensen. Note: Robby and Toni were sisters and both in the Dagenham Girl Pipers. 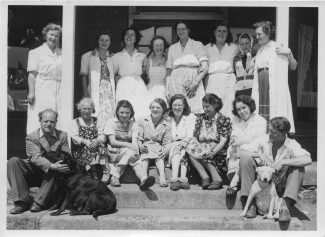 Back row: Unknown – unknown – unknown – Anne Christensen – Edith Hymas – unknown – Ruth Doe – Gayle Christensen. Front row: Bill Cordery with Bess the dog - Mrs Kendal – Betty Keeble – Mrs Keeble – Anne Lewis – Ida Ellerby – unknown – Erick Christensen with Peggy the dog. Left to right: Unknown – Toni – Erik Christensen – Phil Millington – unknown – unknown – Robby – unknown – Anne Christensen – Lal. 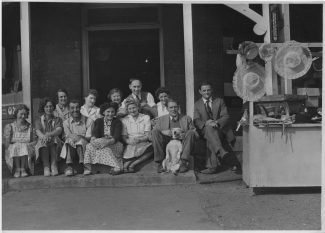 Back row: Unknown – unknown – Ada Atkins – Bill Trihorn – unknown. Front row: Anne Christensen – Doll Millington – Phil Millington – unknown – unknown – Erik Christensen with Peggy the dog – unknown. 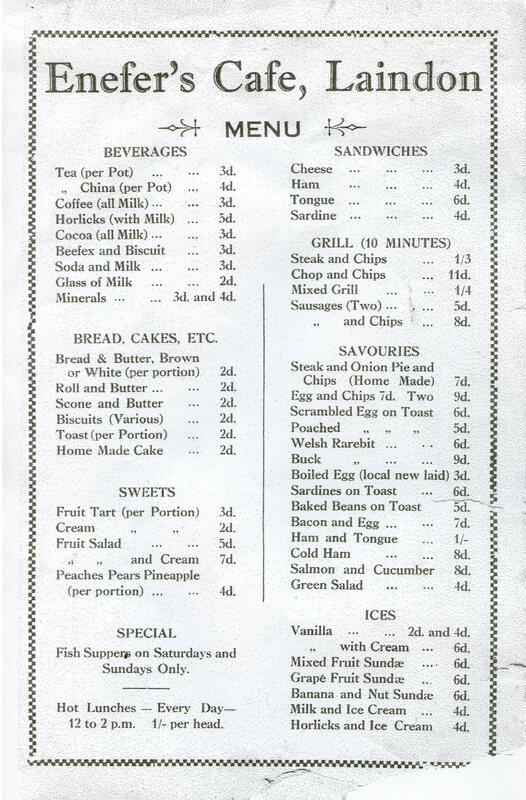 This sample menu shows what good value was on offer. The food and drink had to be served very quickly as lots of the trade came from the many coach parties quick breaks on route to Southend for the day. Those requiring stronger drinks used to nip across to the Fortune-of-War public house on the opposite corner of High Road North (now flats). 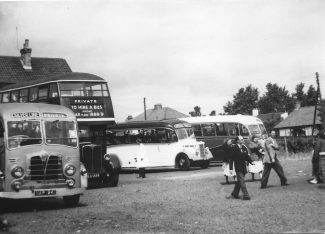 The Fortune-of-War car park was also packed with many coaches as well. 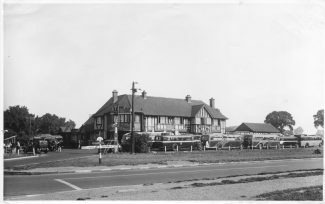 This photograph was taken much earlier, probably in the 1920’s as the A.127 is still a single carriageway and was not made into a dual carriageway until 1936. 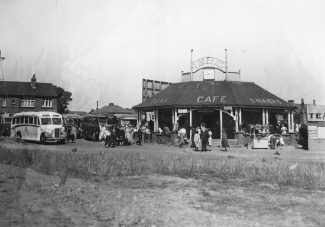 Us “Bikers” used “Enefers” as a local meeting place way back, from the mid 50s to well into the 60s, as well as “Dirty Bills”, (same roundabout, London bound side,) Hatters (half mile towards London) “Jamo’s” (opposite side of A127). We blasted between these three (mostly) and “The Green Tiles” (about a mile before “Gallows Corner Roundabout” Southend side of the A127) and “The Cottage Cafe” (London side of the “Rayleigh Cutting”). All pretty pointless in the grand scheme of things, but hey, that’s what bikers did way back then and it was fun!!J.B. 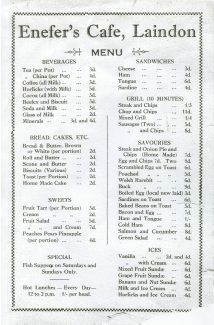 I worked at the original Enefers Cafe in 1982, it was called Jayne’s then. I did some of the grill cooking. I liked working there, it was a shame it closed down. OMG, Robin Lockhart, I remember that concrete pipe! I lived on Kings Road and went to Laindon Park. 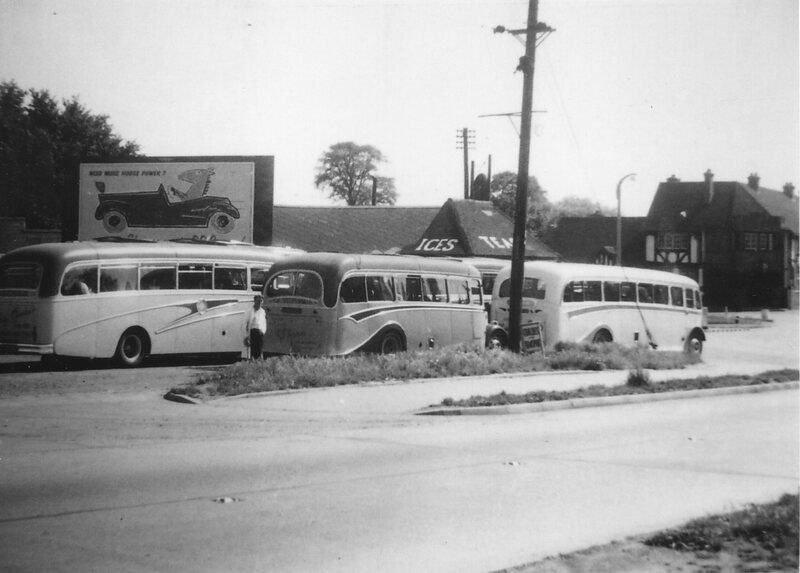 My nan lived on Queens Road, in the bungalow next to ‘Christensen’s’ (as it was in the 1950s.) 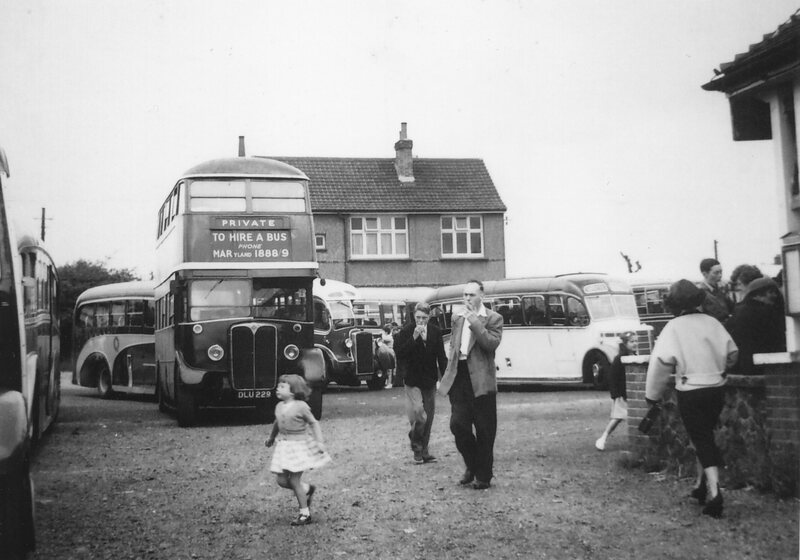 I used to get off the bus at the ‘Fortune’ and go to my Nan’s for a cup of tea and slice of bread and butter before walking up King’s Crescent to my house on the ‘unmade’ part of Kings Road. My mum, who had lived at the Queen’s Road house since she was 2 years old in 1925, worked at Enefer’s when she was a teenager. 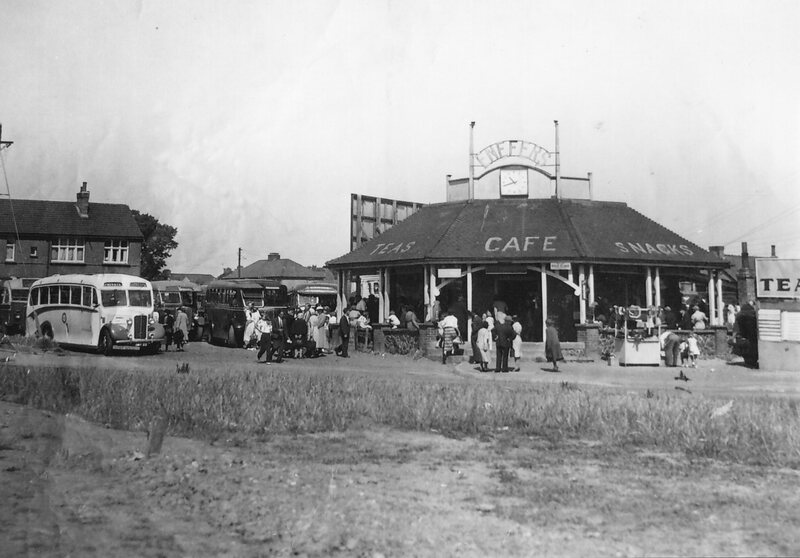 Between the time that this was Enefers Cafe and eventually becoming MacDonalds this was a Happy Eater. What happened to the large concrete pipe that used to lie along side the café, and people would sit on it to watch the traffic go by? My father used to tell the tale that at the beginning of WW2 the boss offered a drum of olive-oil to the local chemists, knowing that it would be in short supply during the war. The offer was refused, but the chemist didn’t say that olive-oil would have had to been B.P.C. standard before he could use it! Re the fourth photo. 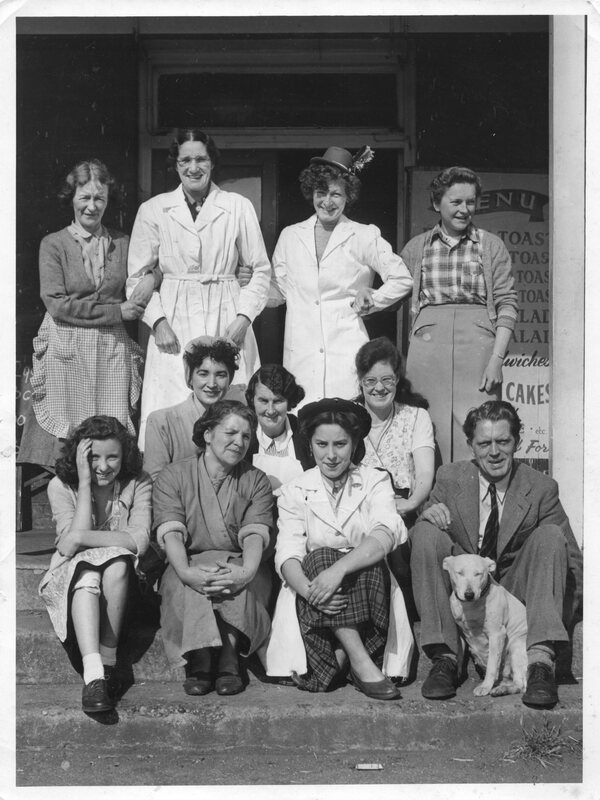 That’s my nan Ida Ellerby, 3rd one in from your right hand side bottom row. 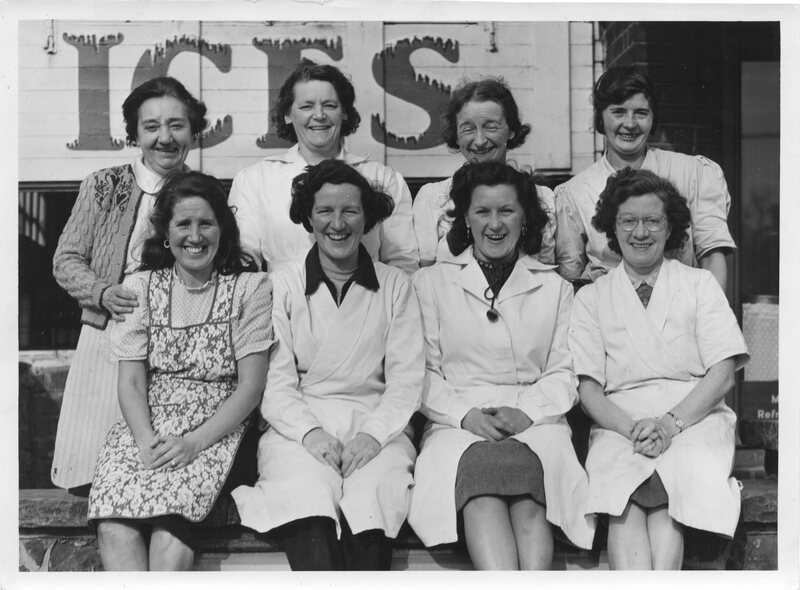 Also I’m pretty sure the second one in from your left hand side top row is my aunt Joyce Ellerby. She married Joe Fay. At this time they where living in Bedford Road, Laindon. Their garden backed on to the Laindon Hotel. There’s now a church on the land of their old house in Bedford Road. They are all good photos. Thank you Ann for sharing.